On 1250 N 3rd Street sits the Olde Kensington Pavilion, a senior home built in 1984 by Old Kensington Redevelopment Corporation (OKRC), one of Kensington’s most active neighborhood associations from the late 1960s through the early 1990s. Originally the site of the Dietz and Watson factory and later abandoned, the non-profit OKRC bought the land from Dietz and Watson for a single dollar – a sign of the deterioration that had occurred since World War II. Since its inception, Olde Kensington Senior Housing Associates, an offshoot of the now-defunct Olde Kensington Redevelopment Corporation, have run the home, which, as of 2010 has 123 seniors living in 103 units. The overwhelming majority of its clientele—about 95% according to Susan Goloshovsky who helps run the home—are from Latino communities in North Philadelphia. This includes people with origins in Puerto Rico, Nicaragua, the Dominican Republic, Ecuador, Cuba, and Honduras to name a few. Goloshovsky maintains that the continued infusion of Latino immigrants in North Philadelphia in recent years and word of mouth in the community have resulted in this ethic mix. In two separate interviews, Connie Galiczynski and Maria Rosario shared their stories about the history of OKRC, the group that adapted this abandoned site into a community senior home. Kensington had been a working-class neighborhood and an industrial powerhouse for over a hundred years, with famous complexes like Stetson Hats providing housing and employment in the neighborhood. However, in the post-World War II period when businesses and factories left the area for the American South, the neighborhood was forced to rebuild amidst much poverty and racial tension. Indeed by the 1980s, the poverty rate of 17% in Kensington was three times the city average. Kensington’s predominantly white residents were well known for resisting efforts at integration by city agencies like the Philadelphia Housing Authority (PHA) formally through their ties to city council members or informally through hate crimes. Yet this closed community of the 1950s eventually became one the most integrated areas of North Philadelphia. In 1960, whites had made up 60% of the neighborhood; by 1978, whites, blacks, and Puerto Ricans each made up one third of Kensington’s population. In fact, compared to other North Philadelphia neighborhoods such as Fishtown, Port Richmond, and Olney, Kensington emerged as the most integrated neighborhood. In Kensington, racial interaction and cooperation occurred between whites, Latinos, and blacks alongside de facto gating practices, like attempts at keeping Section 8 housing out of the neighborhood. Racial mediation by neighborhood activists like OKRC, one of the most prominent neighborhood associations the time, contributed in some cases to increased racial integration of the neighborhood, in others, continued segregation. 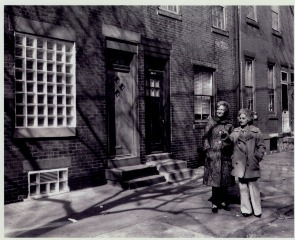 Connie Galiczynski began her attempt to rehabilitate the blighted neighborhood in 1964 as chairperson of Area E in the Philadelphia Anti-Poverty Action Committee (PAAC), a federal program, and later with the creation of Olde Kensington Redevelopment Corporation, which lasted from 1968 until the mid 1990s. Area E covered Northern Liberties, Fishtown, and Kensington stretching from Poplar Street north to Norris Street, Frankford and Lehigh Avenues, from Broad Street east to the Delaware River. As someone who helped provide crucial social services, mediated between groups, connected many neighborhood people with jobs, and developed neighborhood housing for two decades, she provides an important perspective on race relations in the neighborhood. The groups that she led, both Area E and OKRC (both included the second interviewee Maria Rosario), comprised whites, blacks, and Latinos and claimed to represent each ethnicity’s interests in Kensington. There was something that was so unusual about our group. We were a mixed group, and we fought … that we would keep all programs, anything that we got, had to be mixed. It wasn’t for one nationality, one particular thing. We kept it mixed … That’s the way we believed in it … We carried it through. The Area E CAC implemented a variety of social services in the neighborhoods, which also provided a great number of jobs to community residents. For instance, in the program Get Set, Area E participants rented spaces, often in local Churches, where they would hold pre-school for 3, 4, and 5 year olds; they interviewed and hired the teachers who were neighborhood residents. Another program was Community Legal Services, for which CAC interviewed and hired a lawyer for the community. They also hired neighborhood youth in the Neighborhood Youth Corps program for such things as planting trees on Girard Avenue. In their College Bound program, they would maintain contact with high school counselors and provide college tuition to exceptional students who could not otherwise afford to go to college. Rosario explained the nature of the program Tot Lots, which the Area E group designed and PAAC adopted. Eventually, Area E also worked in accordance with Model Cities, Johnson’s next Great Society program from 1966-1974, which focused on public housing. In this program, the government provided money to be allocated between the different areas for the purpose of either rehabbing old houses, or building new ones on vacant lots. The Philadelphia Housing Authority (PHA) got involved as well, trying to implement a “scattered-site” housing program in coordination with Model Cities. Galiczynski and Rosario became dissatisfied with their role in the program and the housing that was being built in their neighborhoods. As residents, they wanted more power in determining the fate of the place they lived. According to Rosario, “You knew your own backyard.” Galiczynski stated that Model Cities would pick the builder, the location, and then rehabilitate the house, while her group was relegated to keeping a close watch on the houses to make sure they were not vandalized. “We decided that we were not going to do that. We would form our own non-profit and build our own houses…” So they formed Olde Kensington Redevelopment Corporation, whose boundaries were from 5th street to Front Street, Lehigh Avenue down to Poplar Street. Galiczynski explained her group’s problem with Model Cities: while OKRC wanted to build and rehab homes for low, middle, and higher income families regardless of race, they perceived the PHA to be interested only in bringing in impoverished people on welfare. By embracing the neighborhood’s increasing integration, yet keeping the income levels in the neighborhood mixed, OKRC thought it had achieved a middle ground in bringing businesses and jobs back to the neighborhood. Moreover, they would work to resurface blocks, plant trees, fix curbs and sidewalks, provide paint to neighborhood residents, and install smoke detectors in neighborhood homes. And, in fact, by 1970 they had the support of Schmidt’s Brewery, the Philadelphia Gas Works, Stetson Hats, and City Planning Commission, all of whom provided either financial or technical assistance. I read in the paper that they were having elections for the poverty program and I didn’t realize I was poor until I read it in the paper… I looked in the paper to see a list of the people who were running… So I called people and got a group…I was as poor as a lot of the people I was helping, but…our philosophy was that if you were given something for nothing, you don’t take care of it. We do not want you to feel that we are against public housing, to the contrary, we feel that, mingled with moderate and middle class homes, they are an asset. However, what we’ve seen to date in the way of PHA houses has led us to the attached resolution. It is our belief that these homes are exactly like the welfare checks, all alike. All a sign of one’s financial difficulty. Whether temporary or permanent they are labeled. We do not desire, want, or need this type of label in our community. We are striving for a permanent re-birth, and, being loaded with these homes, would, to us, be a grave mistake. We feel that in five to ten years, perhaps sooner, they will be in the same shape they were prior to the PHA. Again in 2009, both Galiczynski and Rosario claimed that OKRC wanted a discreet system where people of different incomes and races could mix but nobody knew who was getting what funding to avoid the seeds of resentment. “The way we worked is that we bought them and we sold them. The house may have originally gone for $40,000, but we were selling them for $18,000, and so they didn’t need as much for a down payment.” Galiczynski stated. Throughout its existence, OKRC rehabilitated or built over seventy properties in the neighborhood, their most recent projects having been the Kensington Pavilion and the Kensington Gardens residences on 3rd and West Thompson streets. Over time, the neighborhood became more and more integrated, and according to Galiczynski and Rosario, the people buying and renting houses from OKRC represented this mix. The locus of political power in Philadelphia was beginning to shift in the late `60s from traditional ward leaders to the newly empowered heads of neighborhood associations who now served as conduits between city hall and the neighborhoods. In what was previously a male sphere, women in Kensington gained political power. Galiczynski and Rosario built political relationships with members of city council and the state legislature, and often attended city council meetings. Galiczynski became so well known that at one point, she herself ran for City Council and nearly won a seat. We had a lot a lot of power. What we wanted to have done could be done. I don’t think any of that power ever went to our heads. We were just so glad that we could make changes in the community. Nobody benefited by money … But we knew that we could hire; we knew that we could have. And we did, we could hire. We could hire directors, we could hire people for the office, we could hire secretaries. I mean people like us who had never worked in an office… Don’t tell the women of area E it couldn’t be done, because we would prove you wrong…I think that the big mahoffs didn’t believe that little people like us could get things done, see things through, that we were knowledgeable enough, had enough experience in politics, but we knew what we were striving for and we got it done. I think it surprised a lot of them… Look how long we kept it. Impressively, to Galiczynski’s knowledge, women who got their start in PAAC were responsible for nearly every senior housing project in the city, including the Clara Baldwin House and the Church of the Advocate. And today, the Olde Kensington Pavilion and scores of homes built by OKRC stand as testament to over forty years worth of work these women put into the community.